Nova Scotia (Latin for New Scotland; French: Nouvelle-Écosse; Scottish Gaelic: Alba Nuadh) is a Canadian province located on Canada's southeastern coast. It is the most populous province in the Atlantic Canada, and its capital, Halifax, is a major economic centre of the region. 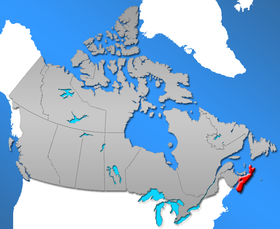 Nova Scotia is the second smallest province in Canada, with an area of 55,284 km². Its population of 921,727 makes it the fourth least populous province of the country. Nova Scotia is the seventh most populous province in Canada with an estimated 957,600 residents as of 2017. It accounts for 3 percent of the population of Canada. The population density is approximately 17.2 persons/km². Roughly 60% of the population live in rural parts of the province. Nova Scotia has three regional municipalities. Nova Scotia has 26 towns, not including the former Town of Canso that dissolved to become part of Guysborough County on July 1, 2012 and the former Towns of Bridgetown and Springhill which dissolved on April 1, 2015. The Halifax population centre is the largest urban area in Nova Scotia. Statistics Canada recognizes a total of 37 population centres in the province. ** Preliminary 2006 census estimate. Mother tongue in Nova Scotia: Red – majority anglophone, Orange – mixed, Blue – majority francophone. The 2011 Canadian census showed a population of 921,727. There were also 275 single-language responses for Turkish; 195 for Non-verbal languages (Sign languages); 30 for Malay; 100 for Bantu languages; 70 for Kurdish; 120 for Slovak; and 5 for Estonian. Figures shown are for the number of single language responses and the percentage of total single-language responses. The 2006 Canadian census counted a total of 45,195 immigrants living in Nova Scotia. There were also 365 immigrants from Australia; 320 from South Africa; 280 from Hong Kong; 255 from Saudi Arabia; 245 from Iraq and from Trinidad and Tobago; 225 from Hungary and from Russia; 220 from Portugal; 215 from Switzerland; 210 from Denmark; and 205 from Belize. A ^ 2011 Census data unavailable, data taken from the 2006 Census. Nova Scotia GDP is presently approximately $33 billion (Can) annually. ^ a b Canada's population Archived November 4, 2008, at the Wayback Machine. Statistics Canada. Last accessed September 28, 2006. ^ a b c d e "Population and dwelling counts, for Canada, provinces and territories, and census subdivisions (municipalities), 2011 and 2006 censuses (Nova Scotia)". Statistics Canada. December 18, 2012. Archived from the original on April 13, 2014. Retrieved January 29, 2013. ^ Population and dwelling counts, for Canada, provinces and territories, and population centres, 2011 and 2006 censuses: Nova Scotia Archived 2016-03-04 at the Wayback Machine. Statistics Canada. ^ Population urban and rural, by province and territory (Nova Scotia) Archived 2006-11-21 at the Wayback Machine. Statistics Canada, 2005. ^ Canada, Government of Canada, Statistics. 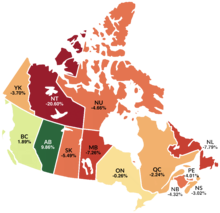 "Statistics Canada: 2011 Census Profile". www12.statcan.gc.ca. Archived from the original on 2018-05-27. ^ contenu, English name of the content author / Nom en anglais de l'auteur du. "English title / Titre en anglais". www12.statcan.ca. Archived from the original on 2008-01-20. ^ "2001 Census". www12.statcan.ca. Archived from the original on 2009-02-11. This page was last edited on 24 March 2019, at 21:43 (UTC).